Presenting to you The most strongest and Funniest Group "BLISSCOMEDY"
DO YOU WANT YOUR EVENT TO COMPLETE WITH LAUGHTERS AND ENTERTAINMENT. 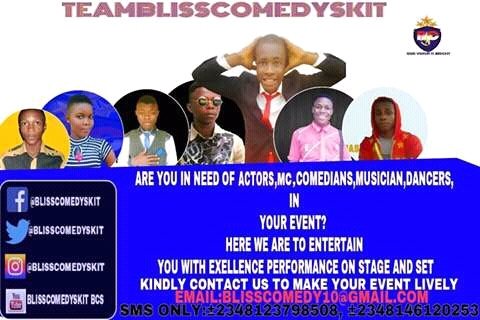 BLISSCOMEDY IS ALWAYS READY AND WILLING TO BLAST YOUR EVENT WITH COMEDY/STAND UP AND ACTING, MC, DANCE and MUSIC. THERE ARE ALWAYS GIVING OUT THEIR BEST TO BE AMONG THE TOP AFRICAN ENTERTAINMENT CREW. FOR YOUR WEDDING, CHILD_DEDICA­TION, CHURCH PROGRAMS, SOCIAL AFFAIRS, AWARD CONVERENCE AND LOT MORE..